Wet springs, bring good and bad things from a weed perspective. First the bad: we often see much more Canada thistle in our pastures, row crops, and roadsides in Wisconsin in wet springs. While this weed can tolerate a wide range of habitats and weather patterns, infestations are more common and visible under these conditions. The past two years I have seen populations establish and expand, due to the spring precipitation mixed with the overgrazing and lack of desirable plant regrowth due to previous years’ drought. As most know, Canada thistle can be very competitive and reduce crop yield, forage utilization and reduce habitat quality in natural areas. The good news is that wet springs increase the chances of a disease infecting and injuring Canada thistle. The most common is a disease called Pseudomonas syringae pv. tagetis, PST for short. This disease is a bacteria that naturally occurs in Wisconsin and infects Canada thistle shoots. While it can also infect many other broadleaf species in the sunflower family, it is most commonly found on Canada thistle in Wisconsin. Symptoms of infection are a distinct bleached or white color of the shoot (see picture 1). Infected shoots have slower development and can increase mortality of Canada thistle populations. Effectiveness appears to be dependent on the strain of PST, level of infection/reinfection and likely many other factors. 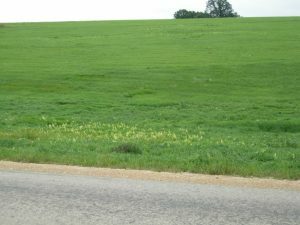 Driving throughout the state the last several weeks I have seen many pastures, fields and roadsides with large-scale infections (see picture 2). Regardless of the level of damage, infected plants are less competitive. In pastures and other grassland settings this is a welcome addition to Canada thistle management plans. To promote the spread of this disease, research suggests land managers mow infected (bleached) shoots when water is present on the leaves. Mowing damages the leaves of uninfected plants and spreads the bacteria to throughout the field. The added moisture improves the chances of the bacteria infecting Canada thistle. Once a leaf is infected it rarely survives. While Canada thistle plants require reinfection every year, populations of PST are likely present to reinfect plants every year IF conditions are right. So embrace the white Canada thistle shoots as one more tool to suppress Canada thistle. This year we certainly need all the tools we can get!